This book presents a comprehensive overview of structural fire engineering. An update on the first edition, the book describes new developments in the past ten years, including advanced calculation methods and computer programs. Further additions include: calculation methods for membrane action in floor slabs exposed to fires; a chapter on composite steel-concrete construction; and case studies of structural collapses. 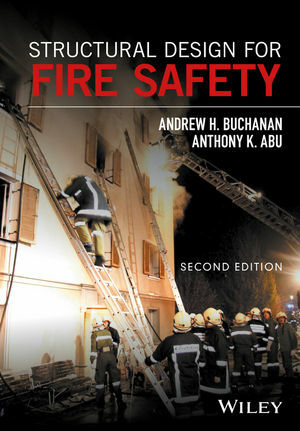 The book begins with an introduction to fire safety in buildings, from fire growth and development to the devastating effects of severe fires on large building structures. Methods of calculating fire severity and fire resistance are then described in detail, together with both simple and advanced methods for assessing and designing for structural fire safety in buildings constructed from structural steel, reinforced concrete, or structural timber. Structural Design for Fire Safety, 2nd edition bridges the information gap between fire safety engineers, structural engineers and building officials, and it will be useful for many others including architects, code writers, building designers, and firefighters. • Updated references to current research, as well as new end-of-chapter questions and worked examples. •Authors experienced in teaching, researching, and applying structural fire engineering in real buildings. • A focus on basic principles rather than specific building code requirements, for an international audience. An essential guide for structural engineers who wish to improve their understanding of buildings exposed to severe fires and an ideal textbook for introductory or advanced courses in structural fire engineering. Dr Andy Buchanan is Emeritus Professor of Civil Engineering at the University of Canterbury, New Zealand. He has a B.E. (Honours) degree from the University of Canterbury, a Masters degree from the University of California at Berkeley, and a Ph.D from the University of British Columbia, Canada. He is a structural engineer with special interests in fire resistance, earthquake engineering and timber structures. After gaining experiences as a consulting structural engineer, he joined the University of Canterbury over 20 years ago, where he established the fire engineering programme, leading to the first edition of Structural Design for Fire Safety in 2001. His recent research interests are in structural design and fire performance of multi-storey timber buildings, including the rebuild of Christchurch after recent devastating earthquakes. Dr Anthony Abu is a Senior Lecturer in Structural Fire Engineering at the University of Canterbury, New Zealand. He has a B.Sc. (High Honour) degree from Eastern Mediterranean University in Northern Cyprus, and a Ph.D from the University of Sheffield, UK. Dr Abu is a structural engineer with particular expertise in building resistance to fires. He has worked with consultancies in both the UK and New Zealand to develop structural fire engineering solutions for stadia, office complexes and airports. He was involved in the implementation of the structural fire engineering Eurocodes in the UK. At the University of Canterbury he teaches structural mechanics and structural fire engineering, and has been involved in fire resistance research for steel, reinforced concrete and timber structures since 2009.